The compressed air system was large, heavy and complicated, so by the end of 1942 Saab initiated cooperation with Bofors to develop an alternative. By 1943 a gunpowder ejection seat with two guns was tried on the ground. Ejection with the Saab MkI seat was straight up and acceleration 15G. Ejection sequence was initiated by a handle on the right side of the instrument panel. The canopy was jettisoned and the chair armed. A knive cut radio and oxygen lines. After ejection the seat straps (by this time the only straps were across the waist) were disconnected automatically, but the parachute had to be opened manually. 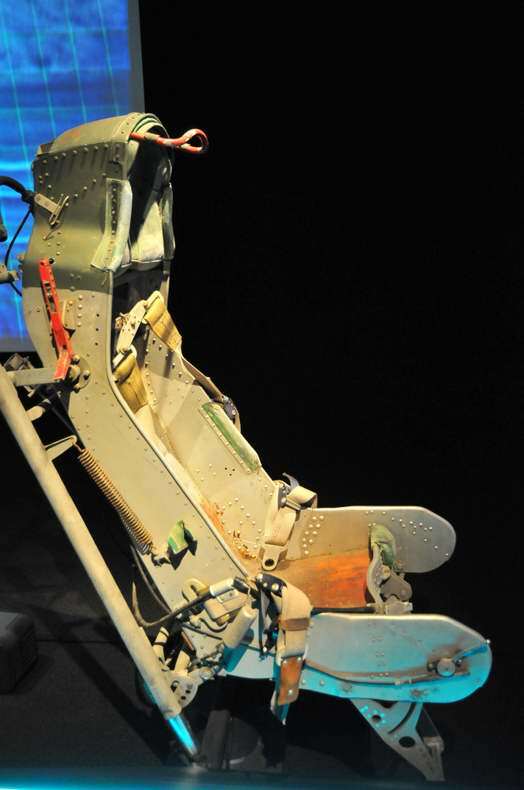 This chair was tried in the air from a Saab B 17 on 27 Feb 1944, which was after the prototype Saab 21 flew. 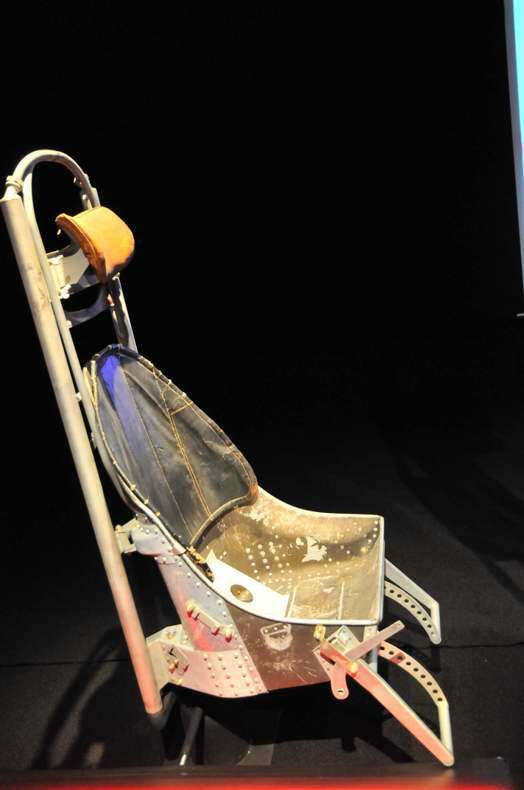 The dummy plus seat weighed 100 kg, ejection altitude was 1200 m and speed was 405 km/h. 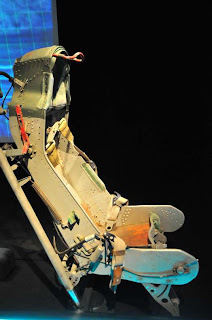 When the first production Saab J 21A on 1 June 1945 it had this ejection seat installed. By this time the seat had been modified by moving the ejection handle to above the left shoulder and shoulder straps had been introduced. The first emergency in Sweden as on 29 July 1946 when a Saab J 21A collided with a FFVS J 22. First ejection from the jet powered Saab J 21R was on 28 Mar 1948. In all there were 25 ejections from both variants of Saab 21 of which 23 were successful from a total of 302 aircraft during the years 1945-56. 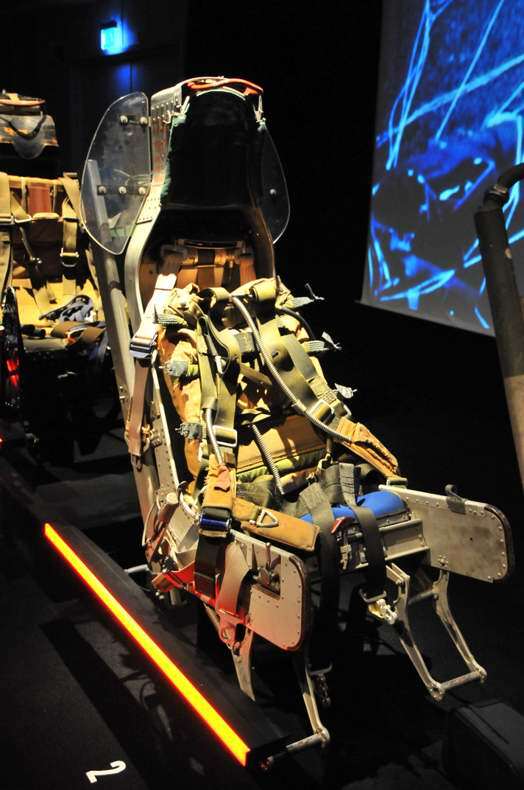 Saab 18 did not have ejection seats fitted from the beginning, but they got it fitted later as a result of the type's bad accident statistics. Out of 244 aircraft 44 were destroyed during 1944-59 and only at four of these crashes were successful emercy escapes made, in spite of ejection seats fitted at least partially as early as 1949. (The first emergency ejection I know about was when the test pilot Schenk ejected from the prototype Heinkel He 280 V1 on 13 Jan 1943 and the first production aircraft with ejection seat was Heinkel He 219.During the war, some 60 German aircrew lives were saved by ejection seats. The seats were powered by compressed air. The jet powered Saab J 21R had the same Saab Mk I type of ejection seat as the propeller powered Saab J 21. The small scale double delta Saab 210, used for trials for the Draken planform, also had a Saab Mk I seat. As the Saab J 29 would be faster, the Mk IIb seat was introduced. In common with the Mk I it had two guns. It was adjustable for pilot height and initiation was by pulling down a face blind. At first harness release was by static line, later on automatic. It was also modified later to delay parachute opening until 3000 m.
This seat was licence manufactured by Folland Aircraft for their Gnat fighter and trainer. The Saab Mk III seat for Saab 32 Lansen had a central gun instead of two. It was initiated the same way as the Mk IIb seat. The prototype Drakens, and the first series aircraft, had a Mk IV seat that was functionally similar to the Mk III. From aircraft number 66, the face blind initition was replaced by a fixed head rest. The initition handles at the lower outer sides of the seat were fitted with Molly guards and a new powder cartridge was introduced. Later on, they were modified in two steps with first a new head rest, more powerful cartridge, better straps and pads to help fix the legs; Then, they got an energy absorging head rest of Klegacell, handles on both outer side to command back up seat separation and a gunpowder powered strap between the ends of the seat to separate it from the pilot. 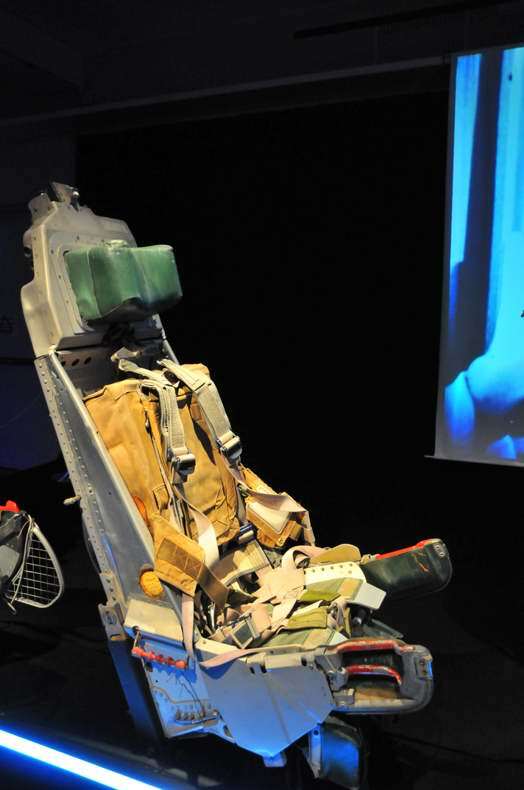 For the J 35D, a seat with the parachute pack integrated was developed. The parachute was of the same type as made by G.Q. Parachute Co. for Folland Gnat. However, the first batch of J 35Ds had the same seat as used in J 35A and J 35B, first the early, then upgraded to the later version. The parachute was integrated into the seat back, the seat bottom contained the emergency pack, including dinghy and so on. The third J 35D batch got a seat that was further modified. 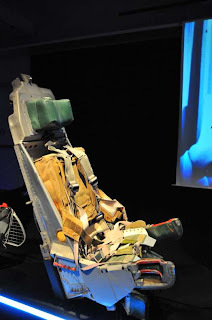 It had a still more powerful cartridge, another mechanism for seat - pilot separation which also had a delay built in at speeds over 515 km/h to make high speed ejections safer, better leg fixing and initiation handles which were better placed and separated from the seat upon ejection. 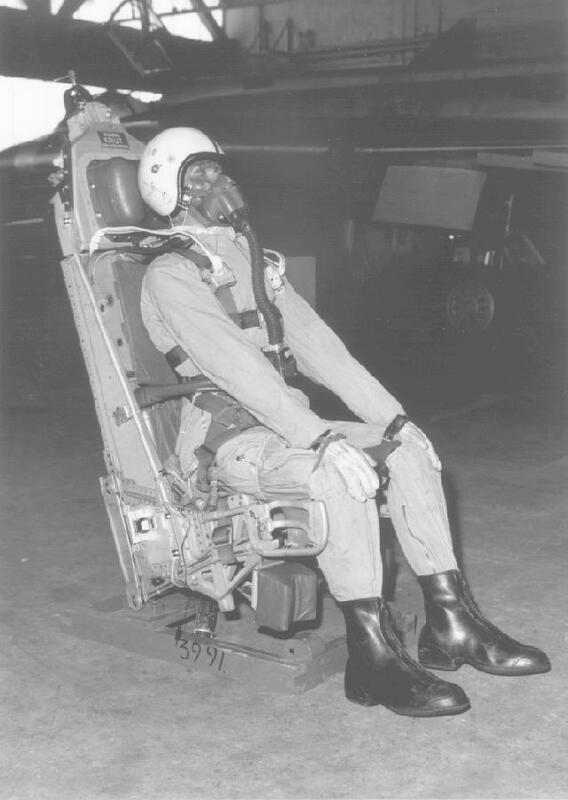 In order to increase survivabilty at low altitude ejections, down to 0 altitude, the ejection seats in J 35Ds were modified to incorporate a rocket motor. This was the Saab RS-35 generation 1 seat. It was retrofitted to all remaining J 35A, J 35B, Sk 35C and S 35E Drakens. The RS-35 genaration 2 was fitted to the J 35F Drakens. 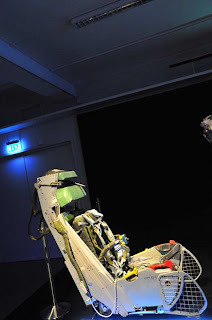 It had a still more powerful cartridge, more powerful rocket engine, stabilisers, longer seat guides, better leg fixing and side guards for the feet and faster acting opening parachute. All remaining Drakens were retrofitted with these seats. Safe ejection speed is 100 - 1150 km/h and altitude 0 - 16000 m.
The pictures of the Draken anv Viggen ejection seats at switched. It looks like the Draken seat is from a J 35 A. At least it's a early one. Thank you, that's been fixed now.